Researchers on Thursday said they have for the first time located a deep-space source for these ubiquitous subatomic particles. They detected high-energy neutrinos in pristine ice deep below Antarctica's surface, then traced their source back to a giant elliptical galaxy with a massive, rapidly spinning black hole at its core, called a blazar, located 3.7 billion light years from Earth in the Orion constellation. Astronomers long have relied upon electromagnetic observations - studying light - but this approach has limitations because too many aspects of the universe are indecipherable using light alone. The ability to use particles like high-energy neutrinos in astronomy enables a more robust examination, much as the confirmation of ripples in the fabric of space-time called gravitational waves, announced in 2016, opened another new frontier in astronomy. This emerging field is dubbed "multi-messenger astrophysics." 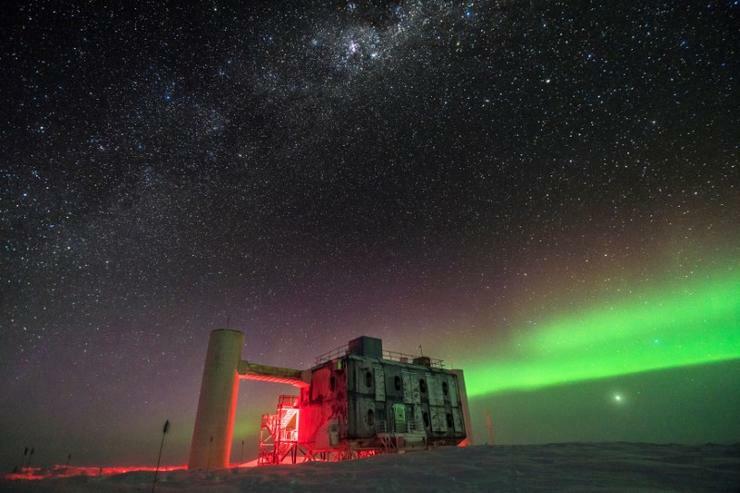 "Neutrinos provide us with a new window with which to view the universe," said University of Alberta physicist Darren Grant, spokesman for the IceCube scientific collaboration. "In many ways neutrinos are nature's ideal astronomical messenger. They can essentially escape their site of production and bring that information directly across the cosmos to their point of detection." The findings solve a mystery dating to 1912 over the source of subatomic particles like neutrinos and cosmic rays that dash through the cosmos. It appears they arise from some of the universe's most violent locales. "One hundred billion neutrinos go through your thumbnail every second, but in all likelihood not a single one of them will ever hit an atom of your thumb in your lifetime," said Penn State physicist Doug Cowen, another of the researchers. "It is accurate to say that we are all swimming in neutrinos." Neutrinos are electrically neutral, undisturbed by even the strongest magnetic field, and rarely interact with matter, earning the nickname "ghost particle." The direction from which they arrive points directly back to their original source. The IceCube neutrino detector involves 86 holes drilled 8,200 feet (2,500 meters) into the Antarctic ice. Some 5,160 light sensors register small flashes of light produced during rare instances when a neutrino collides with an atomic nucleus in the transparent ice. The key detection came on Sept. 22, 2017, with the neutrino ultimately traced back to the blazar. Blazars are probably not the only sources for high-energy neutrinos or high-energy cosmic rays, Grant said, mentioning other objects and phenomena like galactic nuclei, quasars, gamma ray bursts and some types of stellar explosions called supernovas. Reporting by Will Dunham; Editing by Susan Thomas.